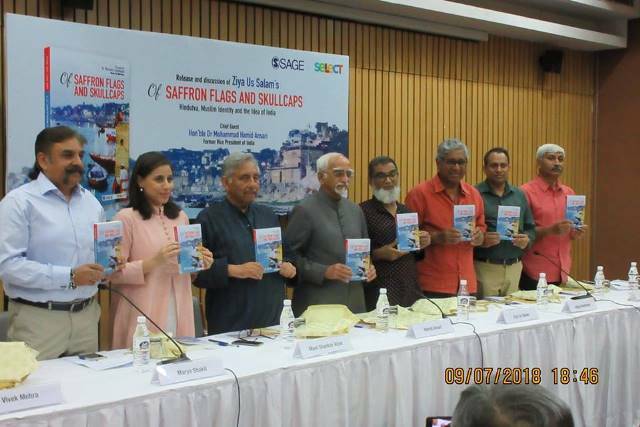 New Delhi, July 10: “Of Saffron Flags and Skullcaps: Hindutva, Muslim Identity and the Idea of India”, Ziya Us Salam‘s clear-eyed narrative of the current political scenario was released by Hon’ble Mohammad Hamid hi Ansari, former Vice President of India in New Delhi. The release was followed by a panel discussion featuring Mani Shankar Aiyar, author of ‘Confessions of a secular fundamentalist, Marya Shakil Political Editor, CNN-News 18; Aditya Mukherjee, Professor, Centre for Historical Studies, Jawaharlal Nehru University; Apoorvanand Jha, Professor, Department of Hindi, University of Delhi, Mohammad Sajjad, Professor, Centre of Advanced Study in History, Aligarh Muslim University and Vivek Mehra, Managing Director & CEO, SAGE Publications India. The event witnesses an august gathering comprising of people from political, social and media arena. 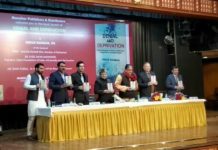 Speaking on the occasion Hamid Ansari said, “I think this is a very serious and carefully written book with a qualitative and innovative approach. The book is not a full-fledged academic book but mentions the happenings, episodes, and practices in an optimist and constructive manner winding them all together into a good read. Also, the book not only addresses the two dominant societies of the country, but also the third, India above all. 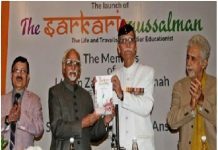 On the sidelines of the launch, the author revealed that the book talks of how sabka saath sabka vikas was replaced with politics of polarization with the killer of Akhlaq, Ravin Sisodia being wrapped in the tricolour by a union minister. 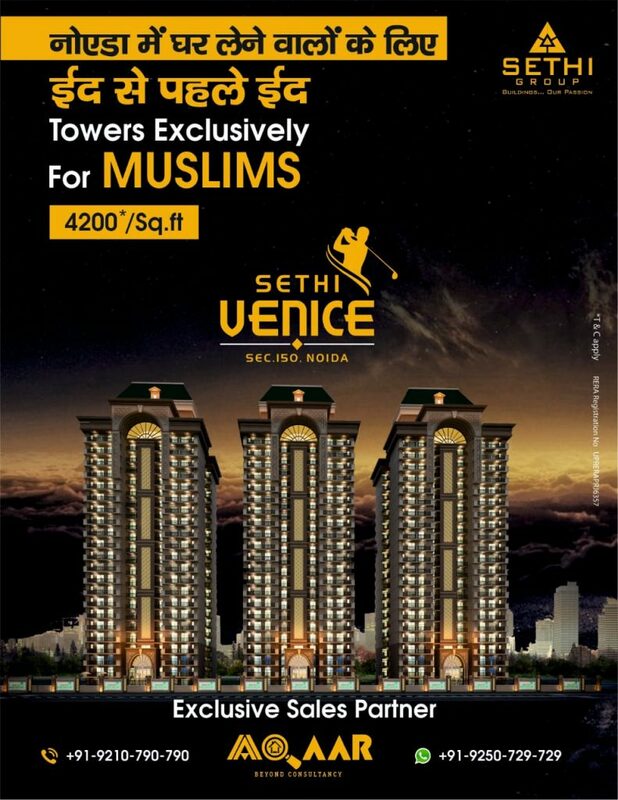 It sent a strong signal to Muslims. “This book is a must-read for every Indian. 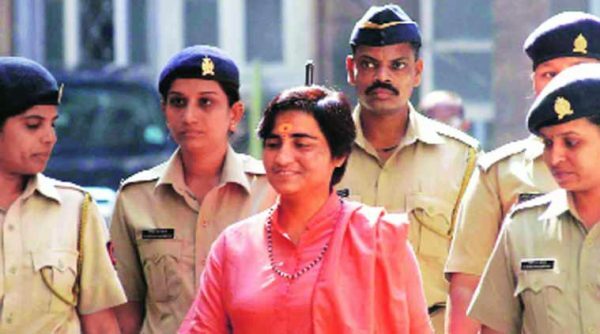 It brings out the frightening growth of religious communalism in India, which threatens to tear apart the delicate fabric woven by the Indian people over the centuries. Yet the author is optimistic that what will endure is this very practice of the Indian people living together for centuries evolving a syncretic, plural, multi-cultural society which our nation builders tried to promote as the ‘idea of India’” he added. Mentioning the similarities between what is happening with Muslims in Indian and what happened with Jews in Germany Prof Apporvanand quoted a writer’s memoirs of Holocaust and said that ‘ a train full with Jews was moving to take them to a Nazi Concentration camp, when the train halted on a platform, seeing the Jews on the children started stone pelting on them, surprisingly it was the same village where Karl Marx was born. We are living in a time when people are cheering up the killers’. 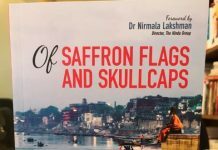 “Of Saffron Flags and Skullcaps”takes a dispassionate look at how majority communalism is sought to be passed off as nationalism; how the new notions of nationalism are removed from the principles of our Constitution. The book speaks of both Hindu and Muslim bodies which are essentially exclusionary in nature. It all winds up on a note of hope with attention to those for whom India is a diverse country with its attendant contradictions but a common soul that acts as a glue. Unity, not uniformity, is the guiding light. RSS has not grown to its present day dimensions just in last four years. It did so ever since Independence under the very nose of the Congress party rule. Ankit sharma wants have discussion with u.please co-operate.we had enough and he is declared….